Throughout history, similar ideas tend to surface at about the same time. Last week, at SQLBits 9, I did some “on stage” tuning of the Paul Randal INSERT challenge. It turns out that at almost the same time, a lab run was being done that demonstrated, on a real world workload, a technique similar to the one I ended up using. You can find it at this excellent blog: Rick’s SQL Server Blog. Last week, I was able to achieve 750K rows/sec (runtime: 213 seconds) on a SuperMicro, AMD 48 Core machine with 4 Fusion-io cards with this test fully tuned. I used 48 data files for best throughput, the subject of a future blog. 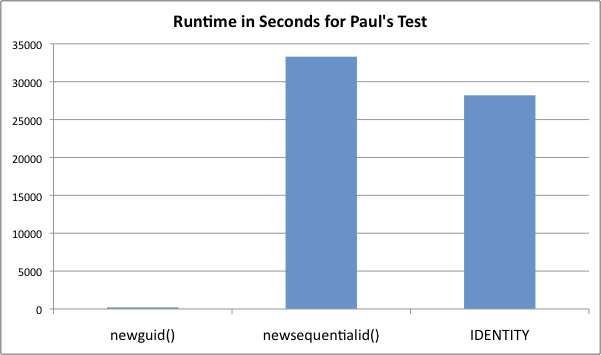 Now, I suspect Paul used NEWID() for key generation, to create as much I/O as possible with page splits. If the goal is purely to optimize throughput, why not ask: Is NEWID really the best way to generate a key? This might shock you! 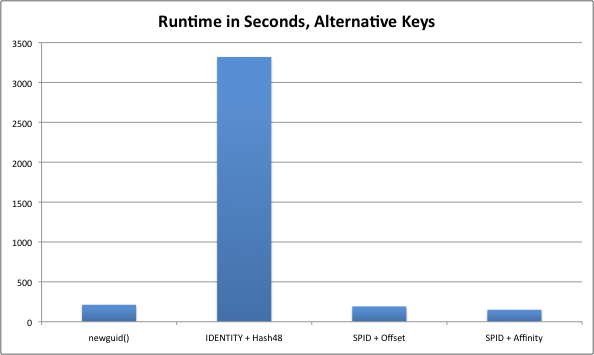 The “Traditional, sequential layout” of the key is more than 100 times SLOWER than completely random inserts! We are waiting for a PAGELATCH on the last pages of the index. This wait dominates the run. The price of page splits is minor (when you have a fast I/O system) compared to the price of coordinating the last page memory access! As Rick writes in his blog, there are ways to work around this problem by being smart about your key generation. Basically, you want a key that is NOT sequential. 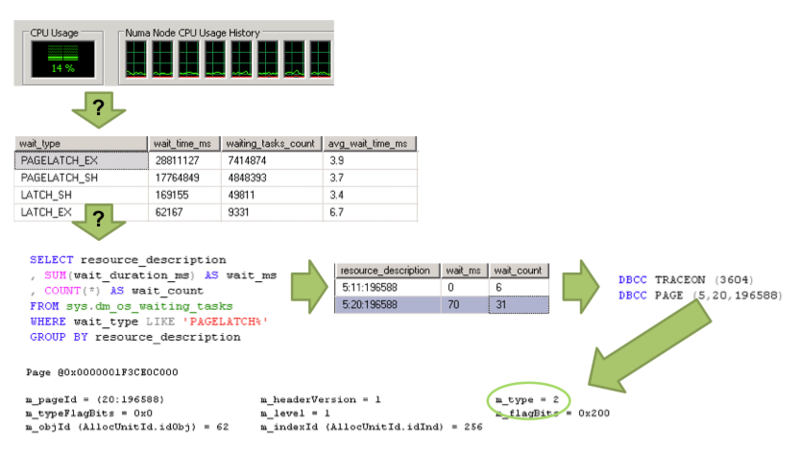 Rick flips the bits around in a Denali SEQUENCE objects – a very neat idea that uses a new SQL Server Denali feature. I also tried the hash trick I have described here – to compare the techniques. The last column is a trick I will describe in more detail in a later blog. Suffice to say that I reached 1.1M INSERT/sec (runtime: 150 sec) using a key generation strategy very similar to Rick’s. The UNIT in the introduction was originally wrong. it should of course be 750K not 750M as can be seen later in the post. Thanks a lot for your great posts and presentations. 1. Working with a GUID to eliminate the PAGELATCH problem. 2. This obviously results in big fragmentation, but after a certain amount of rows is inserted into the table, rebuild the index with a fillfactor of, let’s say, 10%. That way I’m “bucketing” the table and leaving enough space for future rows to enter the right bucket, without causing a large amount of fragmentation. Rebuilds will still be needed, but less frequently when the table reaches a certain scale. Glad to hear you are enjoying my material. Your strategy would be sound and is doable if your goal is to save space. However, before you implement the defragmentation step, you should first measure if the fragmentation has any real effect on the workload (in my experiments, the fragmentation is pretty much irrelevant for the speed). Note that if the table is fragmented and inserts are random (for example using GUID keys) then you will reach a steady state where there is quite a bit of free space in all pages (the ones you just split will have free space). If you were to rebuild the index with 10% FF, you will get a lot more page splits once the inserts resume – until you reach steady state again. Overall, unless the table is read-mostly, I don’t think defragging the table is worth it. I’m intrigued as to what the new sequence feature in SQL 2012 would give you with the cache option used. I believe that Rick mentioned this on his blog. A bit reversed, cached, sequencer would be a very good solution to the problem. Ricks code is great and has been proven to work at very high scale. Oracle has a feature called “reverse indexes” which simply store the bits in reverse order and achieve the same effect. The query optimizer will then flip the bits when you search for a value before it digs into the index. Hi Thomas. Interesting article, thanks. Would you know how read performance is correlated with each approach? Good question. It would depend on the type of read you are doing. For unordered scans and singletons, Perf is pretty much the same. Fr range scans, there is a cost which will depend on I/O system etc. That’s a reasonable concern and one I should have addressed in the blog. I have not seen the write cliff happen on the Fusion cards, even under very long and sustained load (including synthethic high load harness). It really depends on the driver/controller for NAND – the enterprise grade stuff does not run into the issue. Very informative blog! It’d interesting to see if one lets it run for few hours at that rate @ M+ row/sec…. I only ran the test for max one hour. Intuitively, I don’t see why running it longer should change anything – what worries you about it Kunal? Great Blog Thomas and I like the diagram. Did yo try to insert in Heap? I really like the new “this is how I think about it” diagram as it gives, at least to me som insights to how you could go about analysing som long running statements. Keep up the good work, as i really enjoy reading your blog, and find it very inspiring.